HomeCatechetical Issues & TopicsLiturgy and SacramentsDiscovering the Nearness of God: Anointing of the Sick: Healing as God’s M.O. Discovering the Nearness of God: Anointing of the Sick: Healing as God’s M.O. When we talk about “thin places” or “thin moments”—when the veil between heaven and earth seems very thin—we tend to think of places of great beauty or experiences of joy or accomplishment. But thin moments are not limited to experiences of beauty and joy. The truth is, we come face-to-face with mystery at moments of loss or pain. Sickness, the loss of our health, is one of those moments; it is an experience that makes us deeply aware of our mortality, our reason for living, and the question of whether God is present when things fall apart and we are powerless to remedy the situation on our own. Despite the advances of science and technology, we recognize that the power to overcome sickness and the threats it poses often lies beyond our capacity. This explains why people often turn to God when confronted by serious illness—and for good reason: in Scripture, God introduces himself to the People of Israel as a healer! In some translations, the last line of that verse is, “for I am the Lord, your healer.” Thus, one of the very first ways that God describes himself is “healer,” aka “doctor” or “physician.” God wants his people to know that, first and foremost, he is the one who brings health and prosperity—harmony and balance (not to be confused with financial prosperity)—to his people as long as they call on him for help and abide by his will. Healing is what God does. A healer is who God is. Healing is God’s M.O. (modus operandi or “way of proceeding”). And, in the case of God’s only Son, the apple did not fall far from the tree: Jesus, like his Father, is a healer, and he expects his followers to be the same. The Sacrament of the Anointing of the Sick, like all the sacraments, is an encounter with Christ our healer. It is an encounter with Jesus when we need him most: when we are on the threshold of faith or despair, trust or fear. The Sacrament of the Anointing of the Sick is a sacrament of healing. There’s no magic involved. Just as illness affects us at the physical, spiritual, and emotional levels, so does healing. Encountering Jesus and his narrative of compassion and mercy (of rescue, restoration, and reassurance) lifts our hearts and fills us with confidence, trust, and hope. This spiritual healing can and often does bring about healing on the physical level as well. Through the Anointing of the Sick, we embrace a narrative that says Jesus is in our midst and we have nothing to fear because even death cannot separate us from his love. If you want to take a first step in deepening your commitment to Christ, you should begin by caring for the sick. It is where Christ would send you if you approached him to ask what you can do to help. I would go so far as to say that any claim to discipleship that does not place an emphasis on caring for the needs of those who are sick or poor is not a full, authentic expression of Christian discipleship. To be a follower of the risen Christ is to take confident hope into places of despair, especially where people are suffering from illness, so that life may be transformed and have meaning. Christian hope recognizes and acknowledges pain and suffering—the perceived absence of God—but believes in a future that is permeated with the presence of God. When our present is filled with pain and suffering, we become insecure and preoccupied with self-preservation. Such insecurity causes us to be fearful, anxious, and greedy—all qualities that force us to operate out of a narrow space instead of recognizing that we are in a thin space—a thin moment—in which God is present. Hope, on the other hand, embraces the promise of security, which in turn expands the soul and breeds selfless love—the kind of love that reveals the face of God. Christian hope is buoyed by the seeds of a new world already taking shape in this life. It is a hope that energizes us to live differently and compels us to spread the word that life is indeed worth living. This is the kind of hope we are called to bring to those who are suffering from sickness. Illness seeks to author a narrative of hopelessness, fear, and despair. It is up to us, as disciples of Christ, to proclaim a narrative of rescue, restoration, and reassurance. 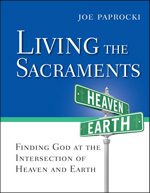 Read more in Living the Sacraments. Discovering the Nearness of God: Reconciliation: Rescue Me! 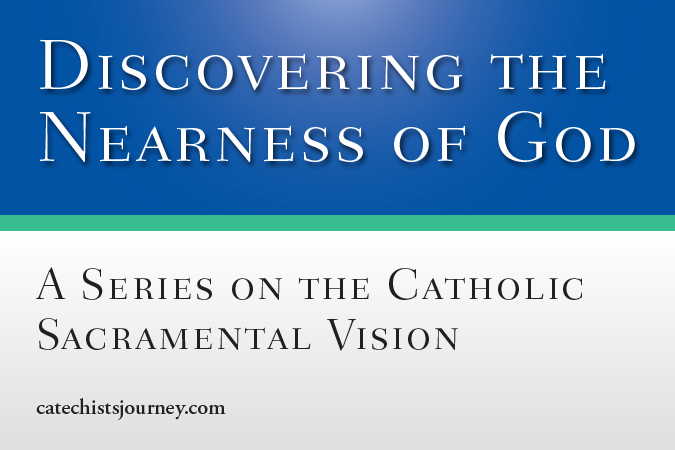 Discovering the Nearness of God: Matrimony: Who Loves You? 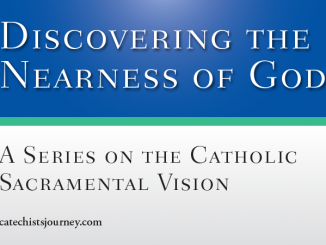 Discovering the Nearness of God: Holy Orders: Oh, to Be Thin! 2 Comments on Discovering the Nearness of God: Anointing of the Sick: Healing as God’s M.O. Thank you so much for this beautiful post and your message of hope. You are very welcome, Frances!